We took a flight between Xi’an and Chengdu, from where we took a cab to the Flipflop Lounge Hostel. This place was great. The rooms were small, but it had a fantastic bar and social area for meeting people, local and foreign, and had a very welcoming and friendly atmosphere. 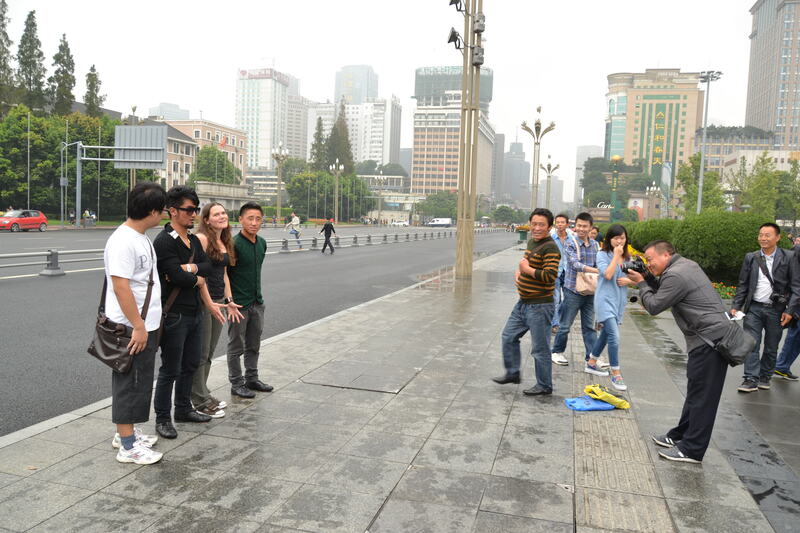 As soon as we arrived in Chengdu we could tell that we were in a less touristy place than Beijing and even Xi’an – we were all stopped on a street regularly for photos, even me! In Chengdu we had the benefit of knowing Tony, the guy who organised our trip to Tibet for us and who my brother had met on his previous trip. On our first night we met up with Tony and went for hotpot – something that we had avoided up to this time a we were promised amazing hotpot in Chengdu – it was pretty good. The next morning our plan was to see the Pandas. Everywhere in ‘mainland’ China functions on Beijing time, despite the area covering five time zones, which meant that despite it being 6.30am when we woke up, it was pitch black. The trip to the Pandas was a group bus trip from the hostel. 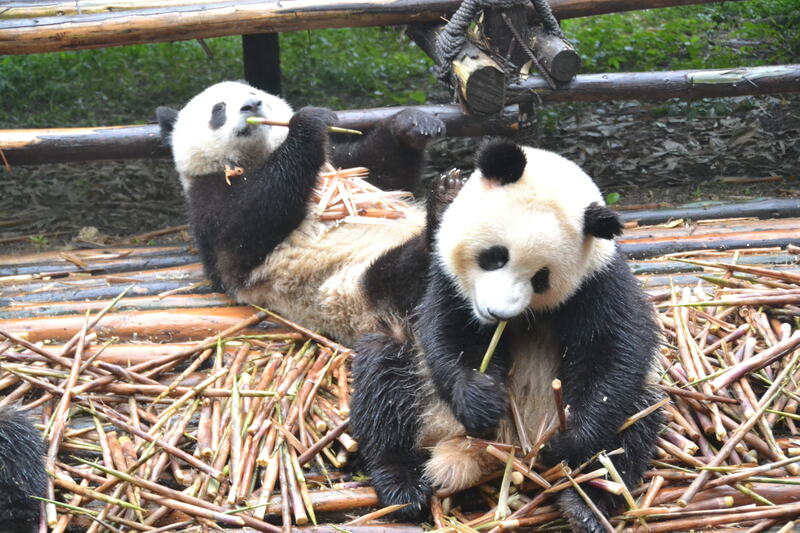 Our guide wasn’t great, he was more of a chaperon than a guide and no where near as good as some that we had previously, but to be fair, the Pandas didn’t require a lot of ‘guiding’… they were amazing. 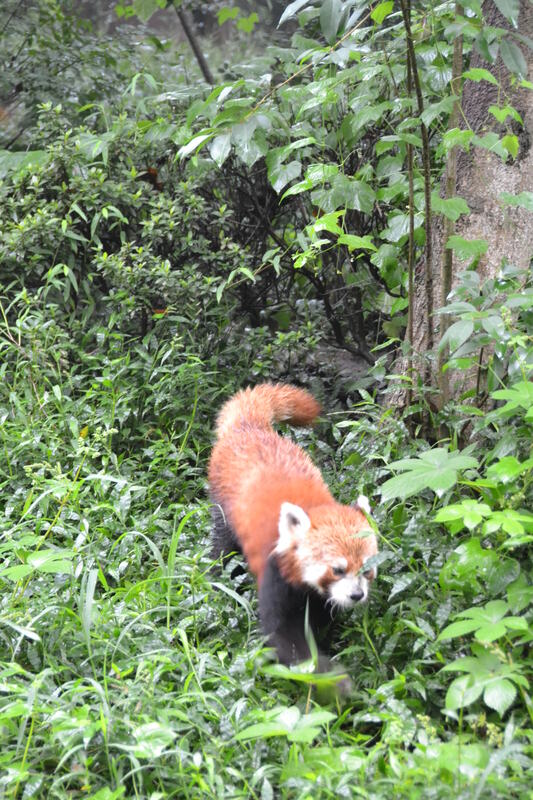 We spent three hours at the panda reserve (I might have just spent two if I was on my own schedule). The pandas were amazing, but it was also quite interesting to watch the people, for whom there was clearly an urge to get 100 pictures of every single panda. We would watch a panda for a bit, and a lot of pictures would be taken, and then we would move ten feet and there would be more pandas of the same type, and another hundred pictures would be taken – interesting to watch modern tourism in action. The pandas were cool though. The tour started with the big ones that were eating their morning meal and making an amazing munching sound the whole time that we were there. 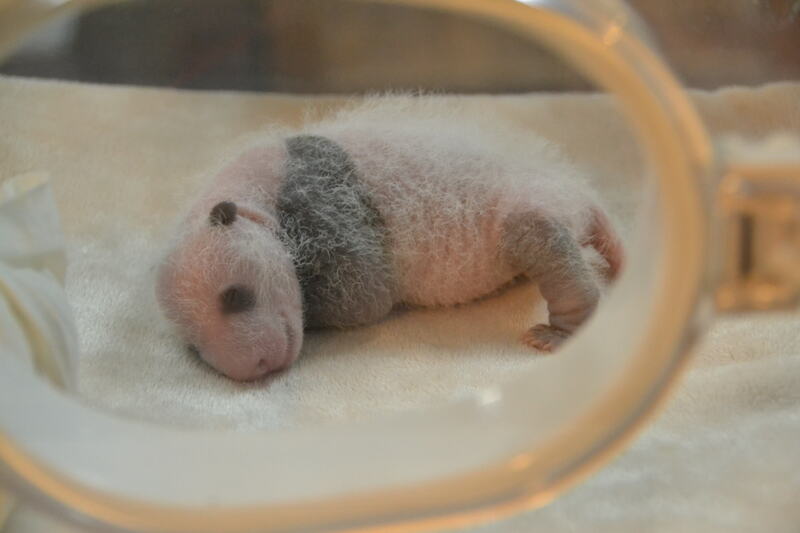 After that we went to the little babies in incubators, which were very cute but had almost no hair, so they were not as cute as the ‘kindergarten’ pandas which had their fur and were very playful. 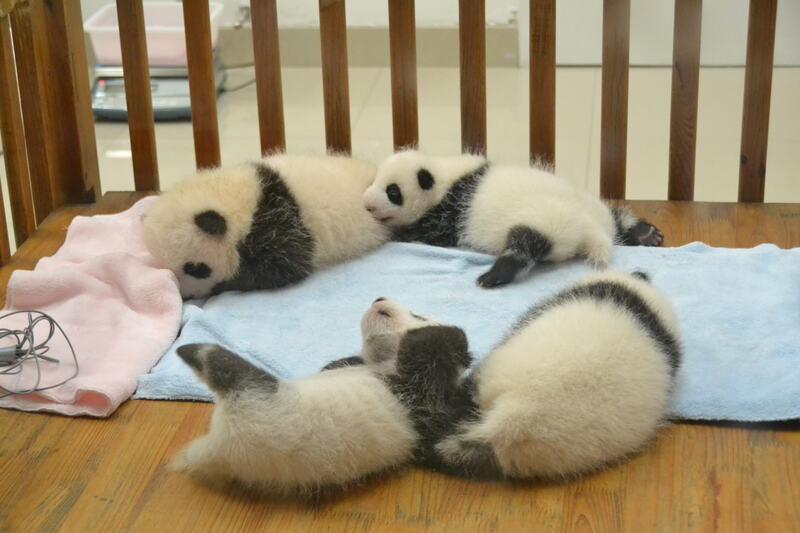 After that we saw the pandas in between the two ages, which did have hair, and again were super super cute. 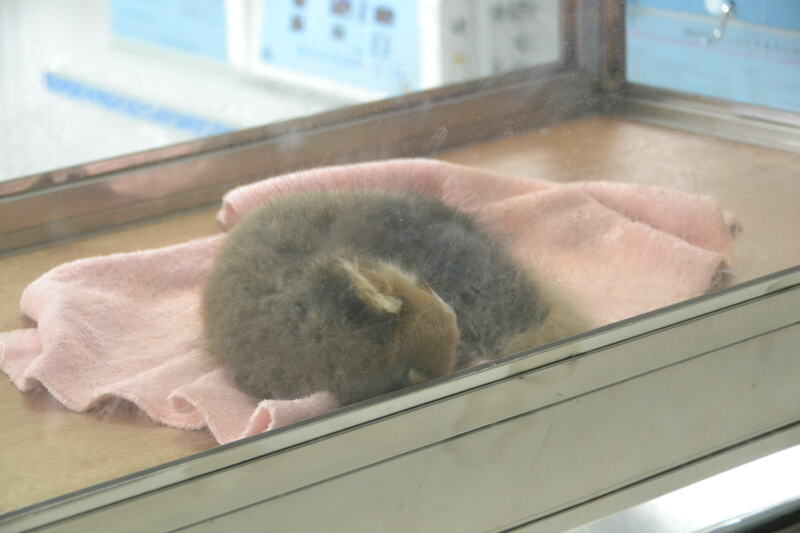 After that it was red pandas, babies and then adults. At the end of the tour we went to an exhibition centre where we watched a video about breeding Pandas and the need to do this artificially as they are not good at reproducing. This was very interesting, but also just hilarious as they kept describing ‘the feeling of love’ between the pandas. 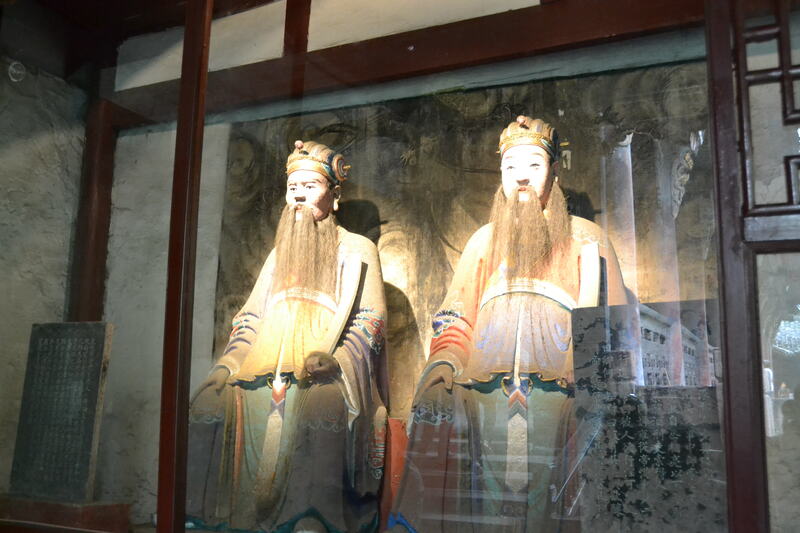 When we got back to Chengdu we went to a place called Dico’s for lunch. It was a KFC style fast food joint that we had seen all over China, and we were just intrigued to see what it was like. It was pretty much your western fast food experience, except that we sent the husband to find us somewhere to sit and the security guard helped him out, clearing the table and making sure no one took it – you would not find that in a western shopping centre! After lunch we went to People’s Park. We saw more people singing and dancing together, like in Beijing. 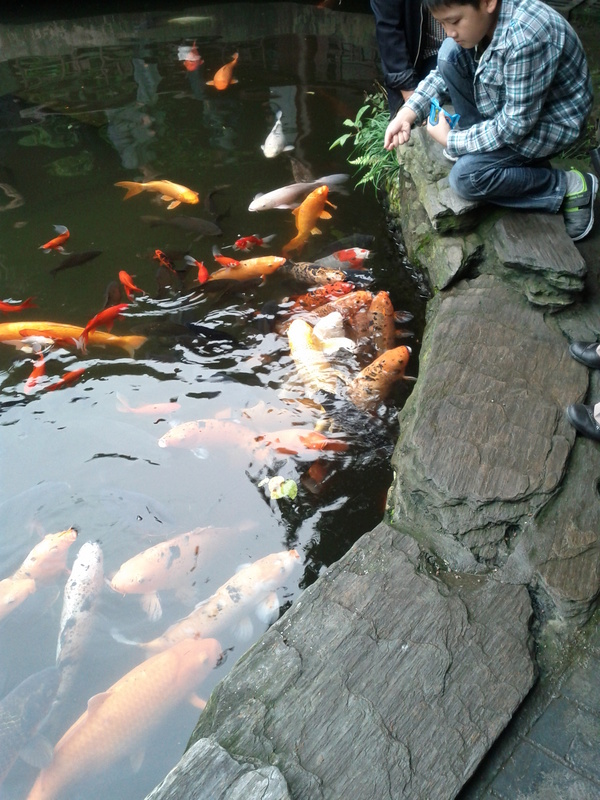 We also went to a pond where there were giant carp which some children were feeding with bottles mounted on sticks, presumably full of fish food. They made this really loud sucking noise and I was sure that they could take a finger. 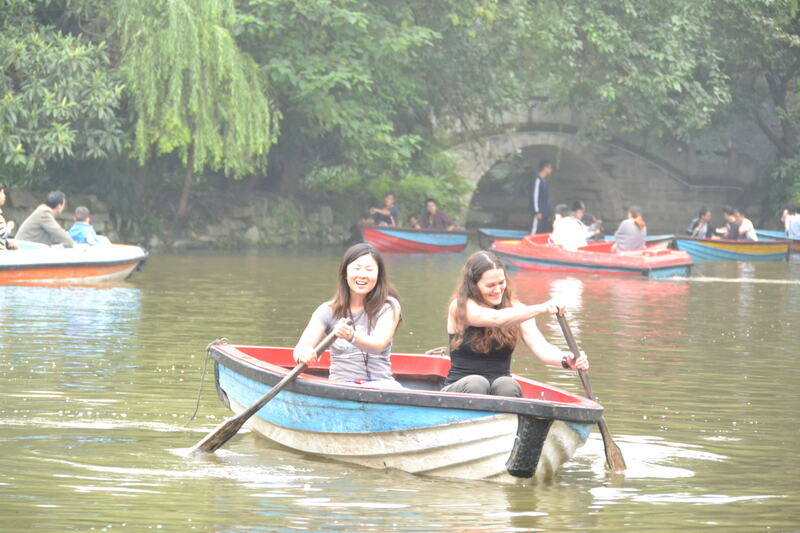 After that we I took a row boat our with my brother’s girlfriend and did a lap of the lake. My brother and husband sat on the side of the lake and were apparently approached to pose for half a dozen photos in the half an hour we were on the water. One young girl told my husband that he was beautiful. Following the park we met Tony and went to one of the most popular tourist streets in the city. It had things targeted at tourists like a wall displaying traditional Chinese home ware, and a bike with a side cart you could sit in. 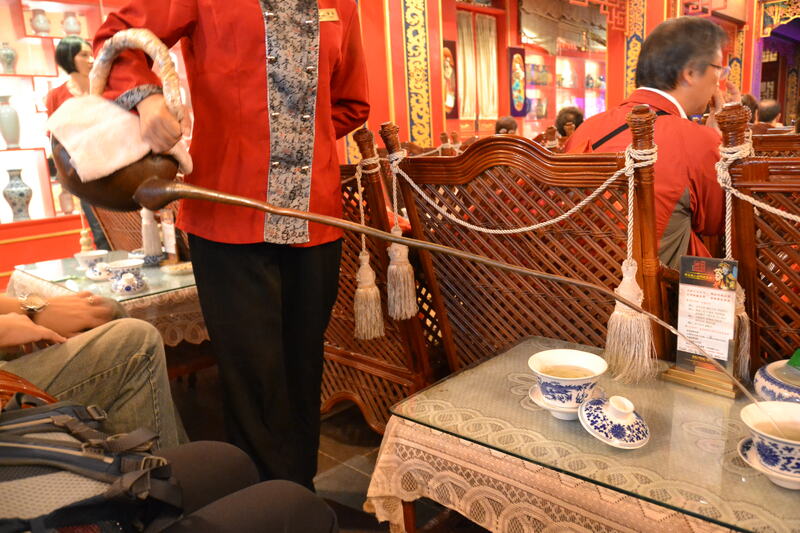 There was a tea house with a massive drum outside. We started posing for pictures pretending that we were playing the gong, and then loads of people gathered around and wanted to take pictures of us – it was a little unsettling. 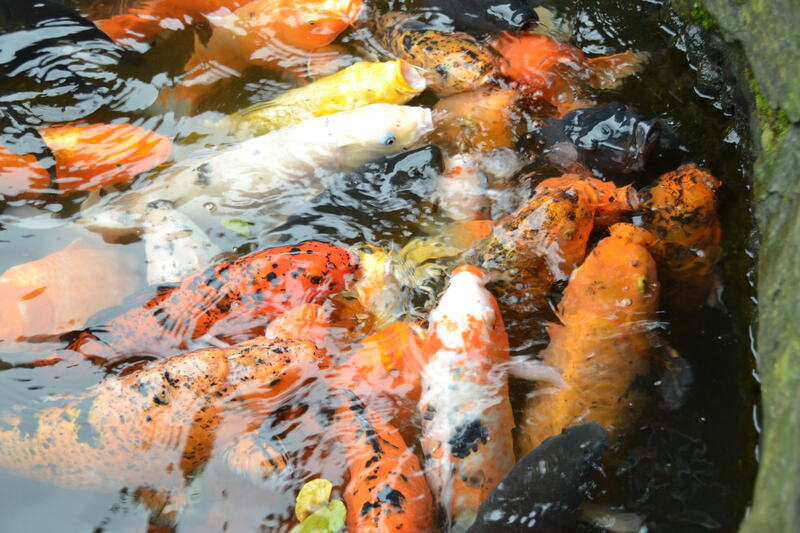 There was also lots of amazing street food – yum!! 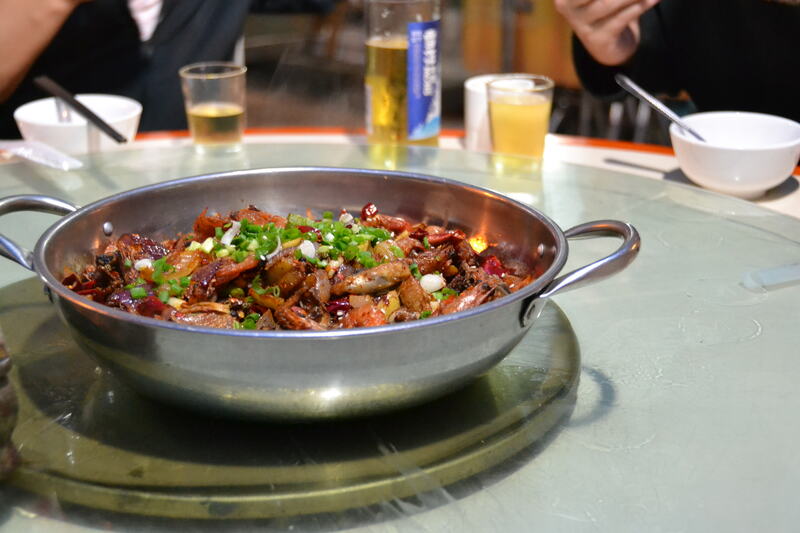 That evening we had a traditional Szechuan dinner, which was basically a mix of meats and veg cooked in spices but it was so good! After that we went to Tony’s flat, which was interesting to see. It was only one bedroom, and the bedroom and bathroom were small, but it had a very large main living space. It was also really nicely decorated. He bought it as a new build so he was able to request quite a few bespoke features. 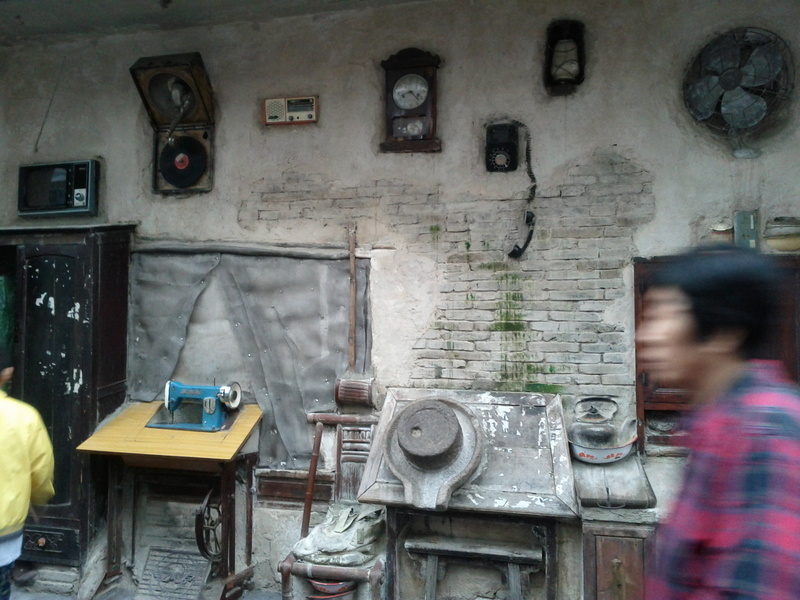 It was minimalist, with the focus on some hanging shelves spotted with a few choice momentos which he explained to us. He made us fresh apple juice and we just chatted for hours, which was nice. We caught the bus back from Tony’s to our hostel (he came with us as he needed to meet two Malaysian women who were also coming on our Tibet tour) and it was great fun. 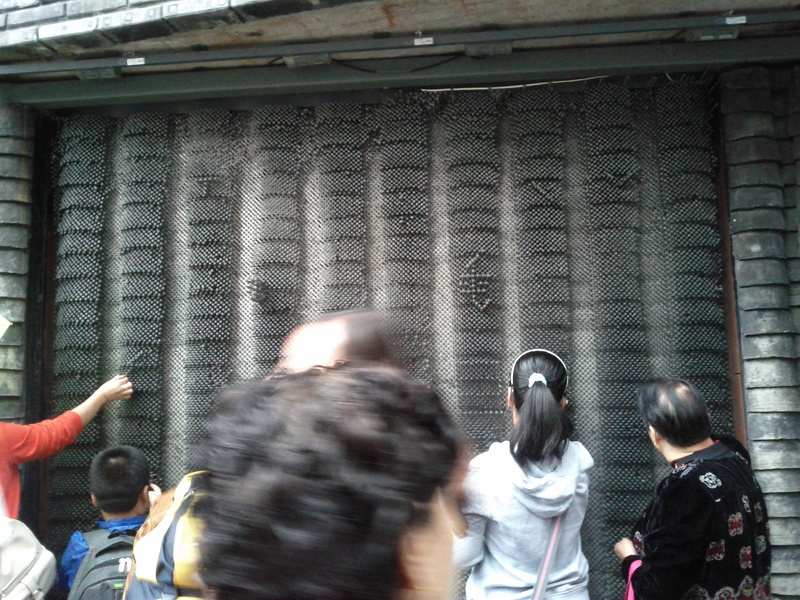 The following day we went for Yum Cha and then into the shopping district to source some thing we needed for Tibet. We went into a big pharmacy called Watson’s, but it proved extremely difficult to find what we needed as none of us knew the word for moisteriser, and all of them seemed to have skin whitening products in them. 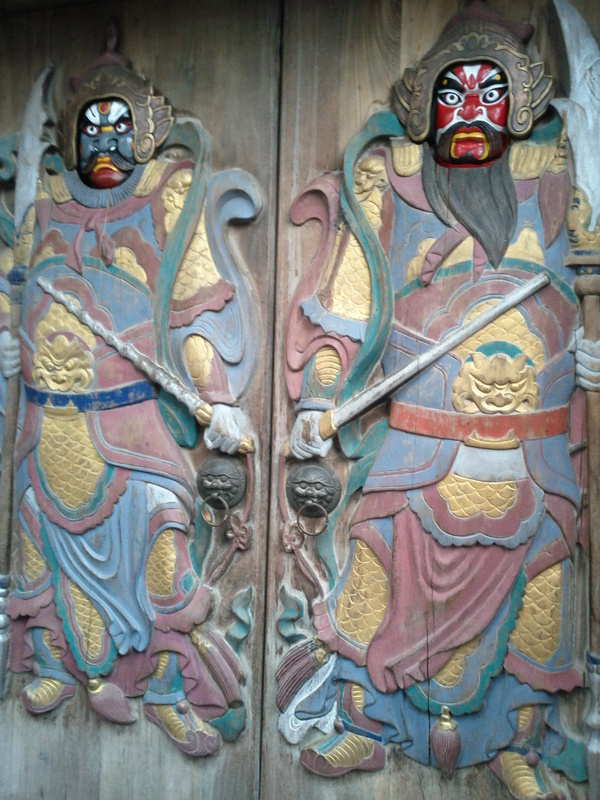 After that we headed to Wahoo Monastery, and then went down the Tibetan shopping street. I didn’t want to buy anything, since we were about to go to Tibet, and it was a bit depressing as there were lots of beggars. 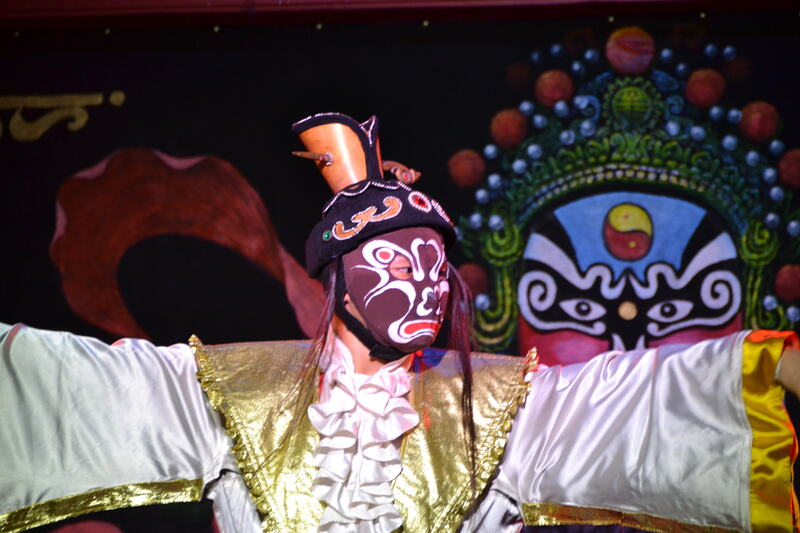 That evening we went to Quintai Road to see the Chinese Opera. 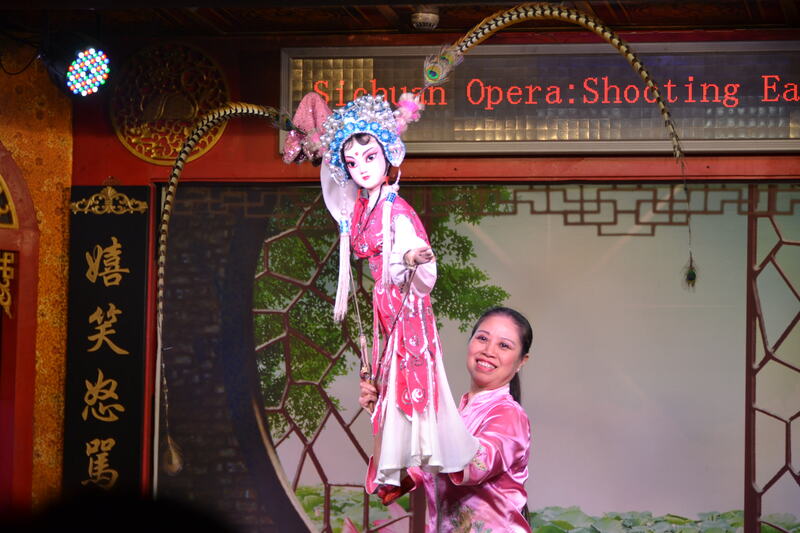 It was nothing like what I expected, more like a variety show than an opera. 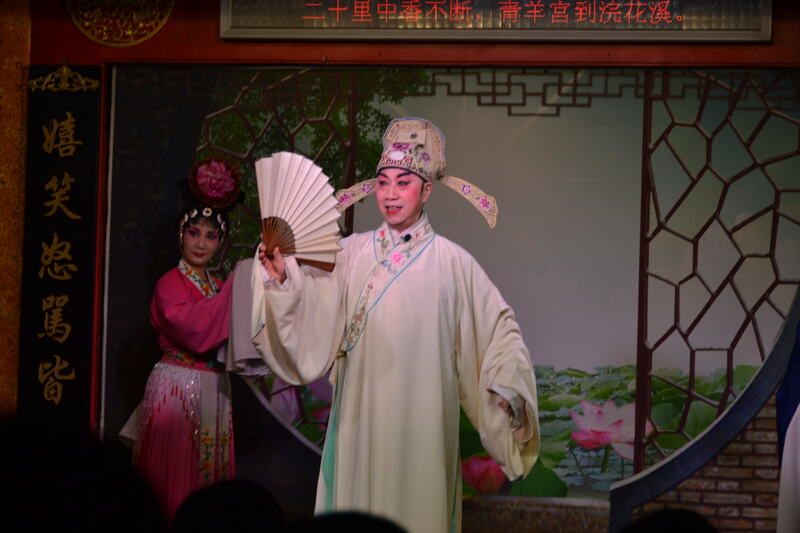 There was traditional Chinese opera, but also shadow puppets, puppet puppets, a girl that did stuff with a yoyo and then balanced things on her feet, including a large table, and then the famous face changing. 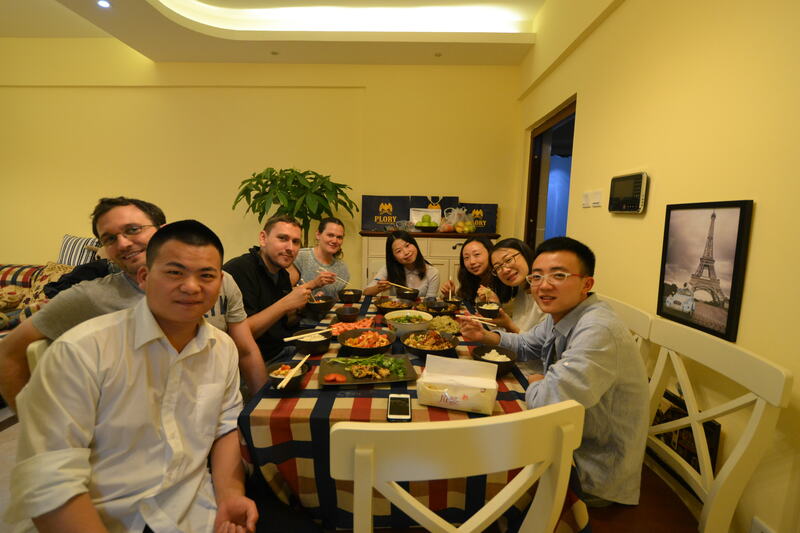 After that we met up with Tony and went for bbq – which was really good! I noticed that when we ate Tony dropped things on the floor, scraps, tissues, cigarette ash, but this seemed completely normal, it was really interesting. On our final day in Chengdu we had a bit of a veg, doing our laundry and hanging around the hostel. My brother’s girlfriend and I did go to what we thought was a small fruit market next door, but it turned out to be a massive food market with loads of fruit, veg, a butchers with live fish (including sea snakes), spices, a bakery, it was amazing, I would love to have a store like that near me. That evening we went to tony’s for dinner with half a dozen of his friends. Only one of them really spoke English, but we had a great chat with her. One thing we tried to do was divine the secret of Szechian spice, but she was not spilling the beans. 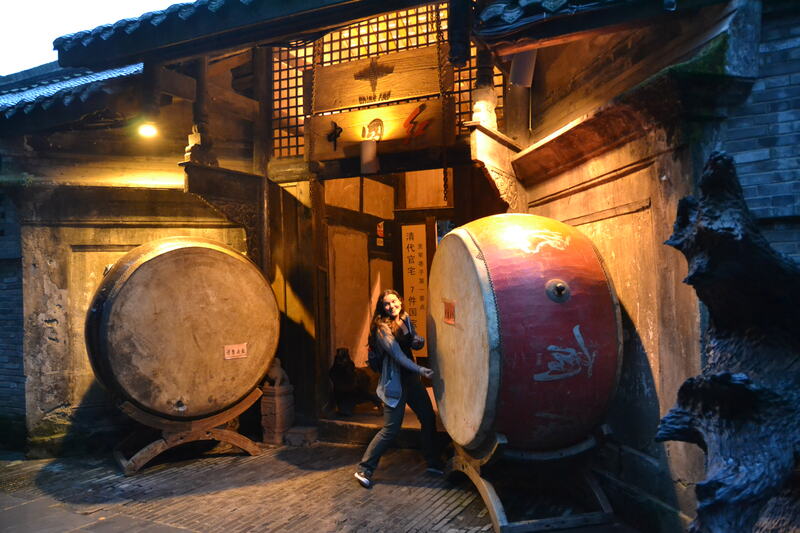 She told us that she had studied fermentation at university, but now worked as a sales assistant. 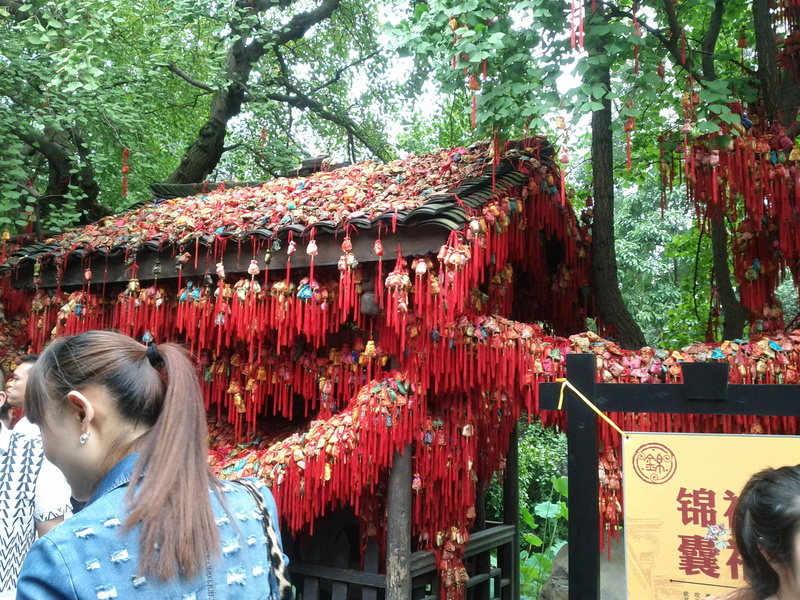 She said that it was not unusual for poeple in China to study one thing and do something else… but I suppose that is true everywhere. 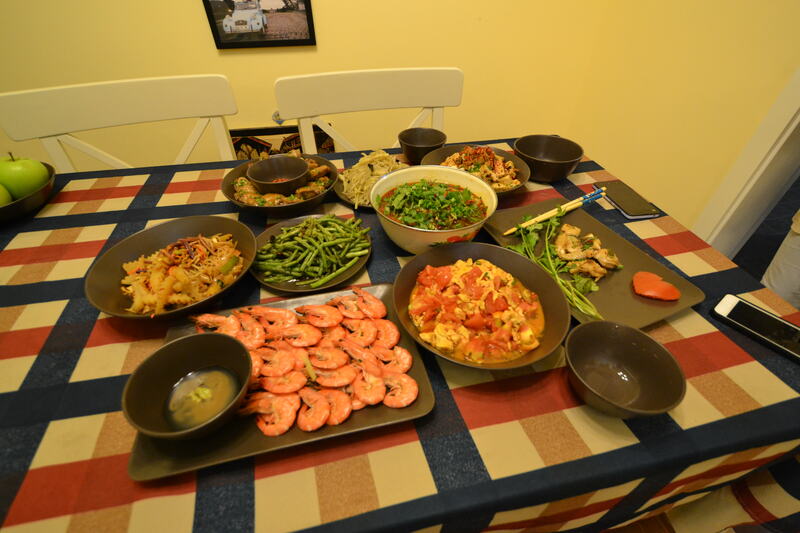 We had egg with tomato; spicy fish, green beans, potato, spicy tofu, chicken with dry peppers and rice. That doesn’t really do it justice, it was all amazing! 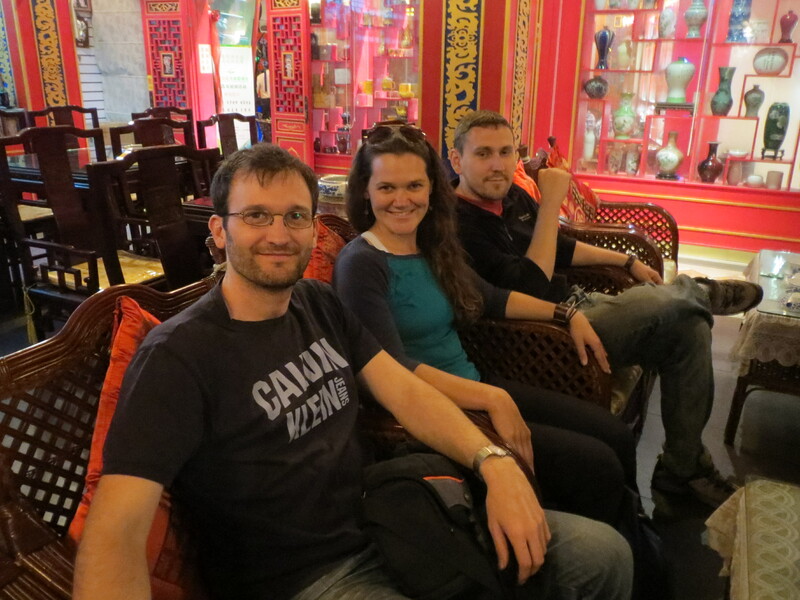 This entry was posted on August 2, 2014 by Jessica Suess in China Expedition.